A Walking School Bus is an organized group of students walking to and from school together on a planned route with an adult Leader. Much like a school bus, as the students walk towards the school, they can pick up more classmates along the way. 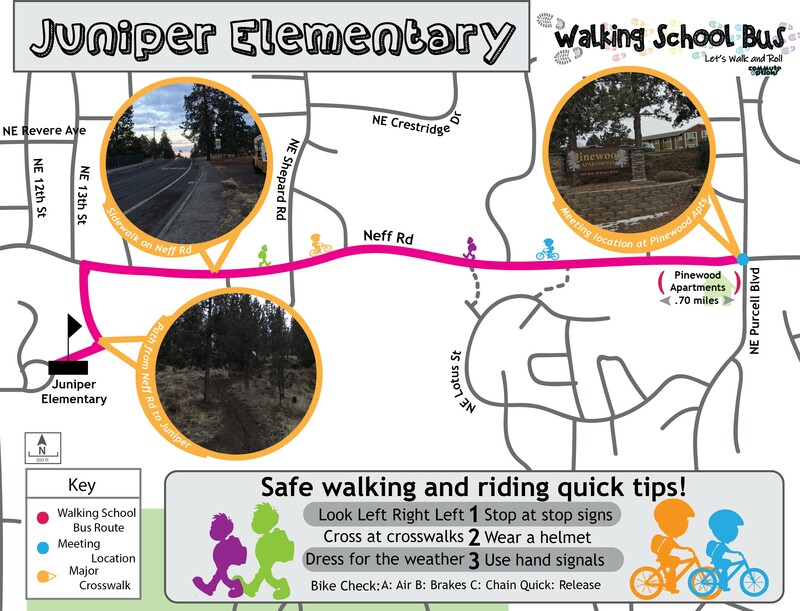 Walking to school just got easier for students and families in Deschutes, Crook, Jefferson and northern Klamath counties through a new Walking School Bus program headed up by Commute Options. Read more in the Cascade Business News article from May 2017, and this coverage from The Central Oregonian in November 2018. 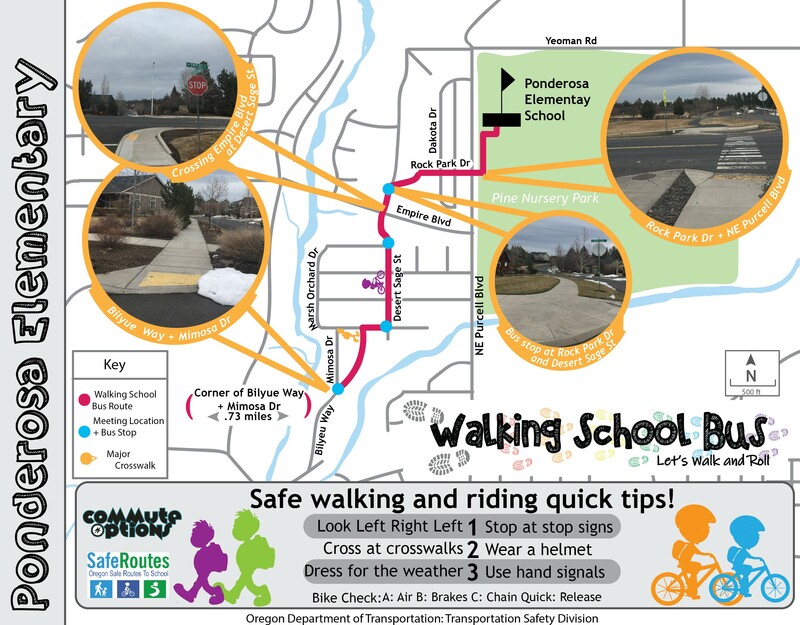 A big thank you to the Central Oregon Health Council ‘s Cardiovascular Disease and Diabetes Prevention Workgroup for funding this new Commute Options program! 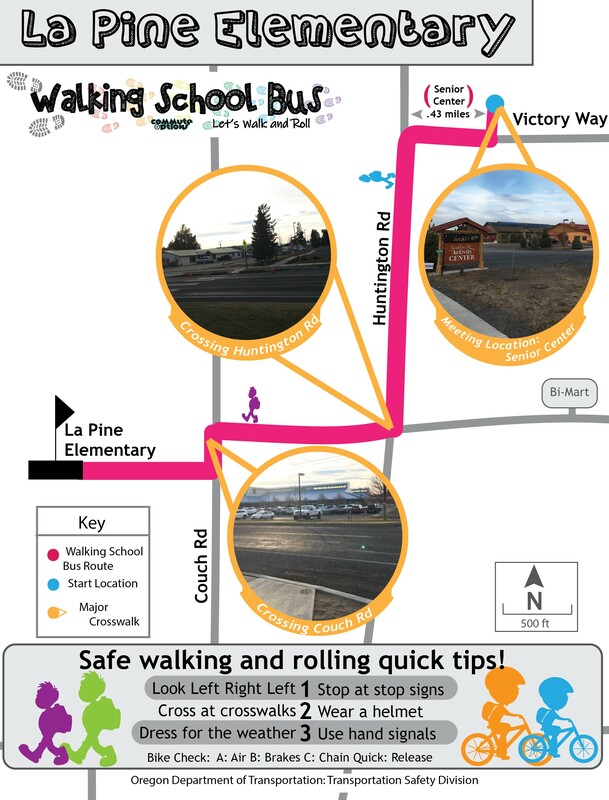 A Walking School Bus is a group of students walking or rolling to and from school on a planned route with a trained, adult Leader and volunteers! Park and Walk. Live too far from school? You can drop off your student at your school’s meeting location. Is there a Walking School Bus at your school? Contact kersey@commuteoptions.org or ask at your school office to find out. Walking School Buses provide many benefits for students and families! Minutes of physical activity increased! Fun for students, families and the community! 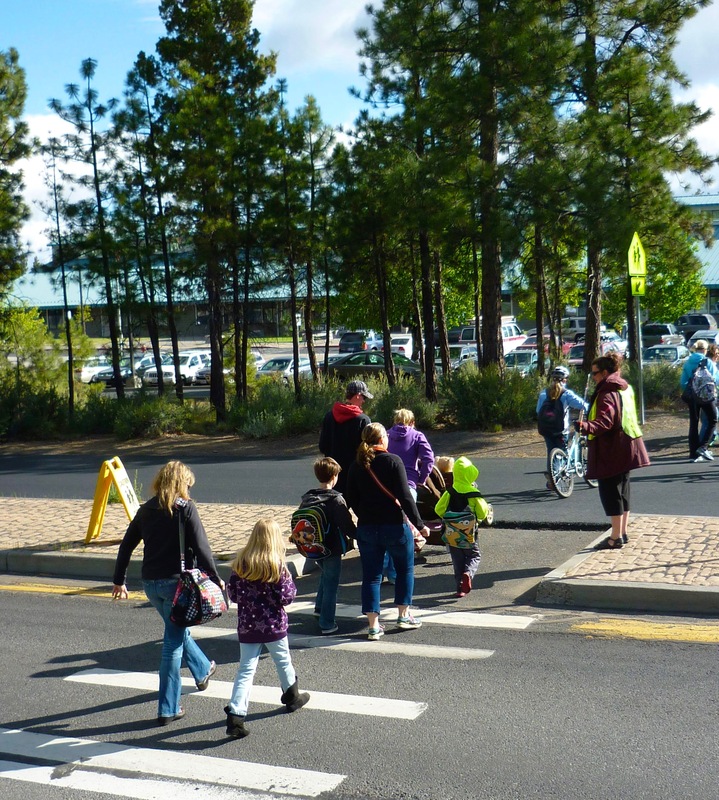 Students need to register before joining the Walking School Bus in your school neighborhood. 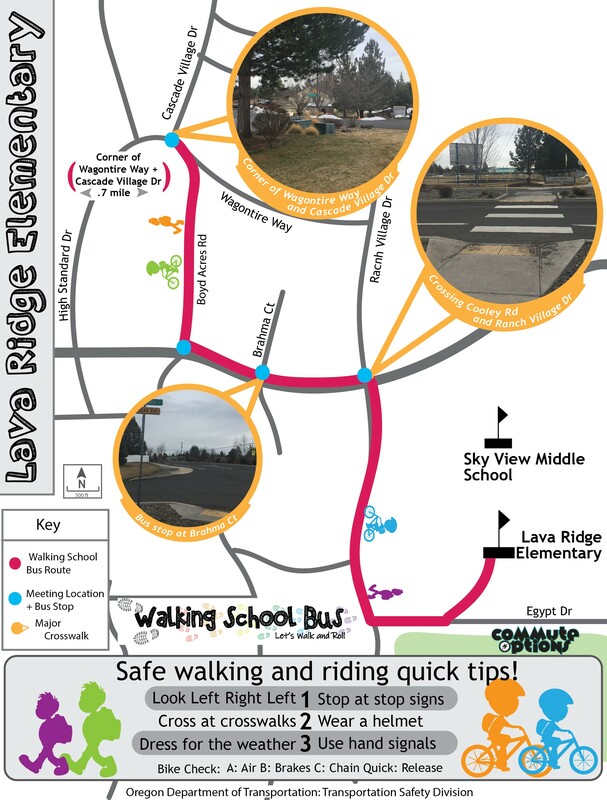 Lava Ridge Elementary: Starts April 30, 2019! Miller Elementary: Starts May 8, 2019! Wednesdays: May 8th, May 15th, May 22nd, May 29th! Contact Kersey Marion if you need a paper form to fill out. Commute Options trains and employs adults to guide students to and from school! Leaders commit to a minimum of 1 school, 2 days per week. Leaders meet students at the designated meeting location and walk with the students along the suggested route. Adults must pass their school district’s background check and are then provided a thorough training from Commute Options. Contact your school district to complete your background check and email the confirmation to Kersey Marion before proceeding. Get your student clubs, parents and staff involved with event days, marketing within the school and the community and getting your Walking School Bus moving! Contact Kersey Marion to find out how to get your school involved. Support the Walking School Bus as a Volunteer! Assist the Leader when you are available. Volunteering is a great way to spend time with your children and the community. Walk with the group to and/or from school to provide additional support. All volunteers must register before participating in the Walking School Bus. 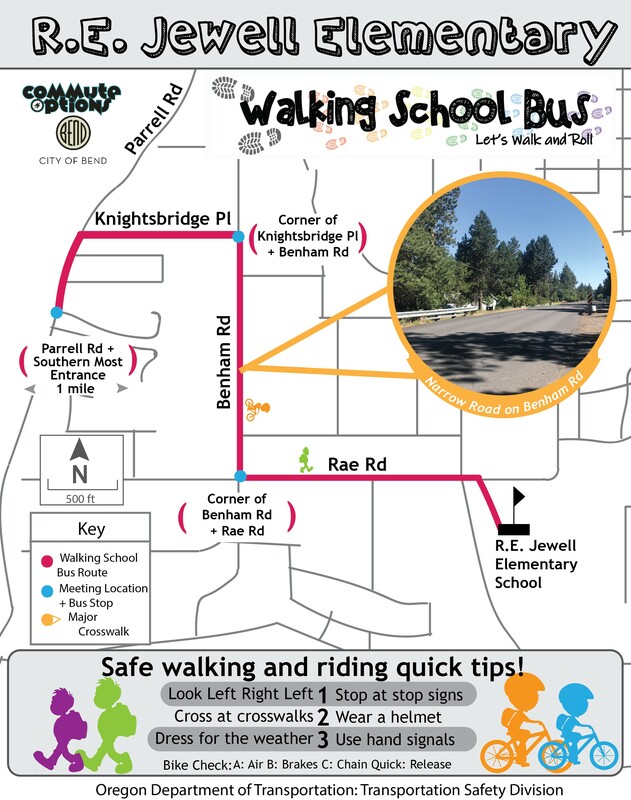 Community Organizations can be a great partnership to bring Walking School Buses to neighborhoods! Your organization can recruit the children already using your facility to provide this free opportunity to them and their families. Contact Kersey Marion to find out how to get your organization involved.